License renewal for continuing education providers in Florida is currently underway. All current CE provider licenses will expire after May 31, 2019. To assist providers in renewing their licenses refer to the instructions below. Go to myfloridalicense.com, and select “My Account.” If you already have an account, log in using your email address or user ID and password. If you don’t have an account, click “Create My Account” and follow the instructions. If you cannot access your account using your access code, contact the Board office at (850) 521-0500, ext. 113. Once you have accessed your account, you may change your contact information, if necessary, and then continue the process to renew your license. You will then pay your fees and renew your license. For CE providers conducting Florida laws and rules or professional ethics courses: After processing your renewal, please complete the Laws and Rules Application and/or the Professional Ethics Application found on our website on the Provider Application Process & Renewal page under the Continuing Education section. Follow the instructions, and mail to the FBPE office at 2639 N Monroe St., Suite B-112, Tallahassee, FL 32303-4064. Questions regarding the CE provider renewal process can be directed to the CE desk by calling the Board office at (850) 521-0500, ext. 113, or emailing cedesk@fbpe.org. If you did not renew during this past renewal period, you will need to contact the Board office at (850) 521-0500, ext. 113, for assistance in renewing your Florida CE provider license. Rule 61G15-22.008, F.A.C., Record Keeping, states that Professional Engineer licensees are responsible for maintaining sufficient records demonstrating completion of qualifying professional development hours for at least two licensure cycles, or four years. PEs are subject to random CE audits. Failure to comply with this rule may result in a loss of the provider license and the ability to provide continuing education courses to Florida engineers. The most current statutes and rules as it relates to the practice of engineering can be found on the Statutes and Rules page under the Legal section on our website. FBPE has compiled the following questions and answers generally asked by our continuing education providers during each renewal cycle. We hope this information will provide clarification of some of the most common issues that arise each biennium and how to get them resolved. If you have any other questions or require additional information regarding any of the information below we encourage you to contact the Continuing Education desk at the Board office at (850) 521-0500, ext. 113, or email cedesk@fbpe.org. 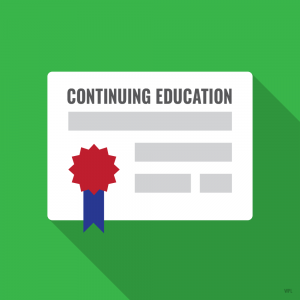 What is the renewal fee for continuing education providers? The renewal fee for the 2019-21 biennium is $250 for current CE providers. If you did not renew during this last renewal period, you will need to contact the Board office at (850) 521-0500, ext. 113, for assistance in renewing your Florida CE provider license. What is the application fee for courses in laws and rules, and in ethics? There is no longer an application fee to register a Florida laws and rules or professional ethics course if you are current Board-approved CE provider. If you are a currently providing one or both of those courses, you must complete the Application Form for each course after you have processed your provider renewal and submit the application to the Board. If you are not currently providing a Florida laws and rules or professional ethics course, but would like to obtain course approval from FBPE, you must submit the CE Provider Application for the appropriate course. How do I access my account? Go to myfloridalicense.com. Click on “My Account” in the blue box in the upper right. Either log into your existing account with your email or user ID and password, or click “Create My Account” if you do not have one. The process is similar to that used by Professional Engineers to log into their accounts, which is illustrated on our website. I forgot my password to access my account. How can I retrieve that information? If you attempt to sign into your account to renew your license and have forgotten your password, select “Forgot Your Password.” You will be prompted to your email address or user ID, and then answer your security question. A temporary password will be emailed to you, which you can use to log into the system and set a new password. If you do not know the answer to your security question, please follow the instructions provided in the question below. I forgot the answer to the security question associated with my account. How can I get that information? Contact the Board office at (850) 521-0500, ext. 113, or at cedesk@fbpe.org. Once we have retrieved the information for you, an email will be sent to you with the answer to your security question. It may take up to 24 hours to complete your request. If you are sending an email request to retrieve your answer, you must include your name, license number, and email. I am using my information to login, but I can’t access my account. What do I do? We can help. Contact the Board office at (850) 521-0500, ext. 113, or at cedesk@fbpe.org. If you have any questions regarding your obligations as a continuing education provider after reviewing Rule 61G15-22.012, F.A.C., Obligations of Continuing Education Providers, the rule regarding CE reporting, Rule 61G15-22.008, F.A.C., Record Keeping, or the CE requirements for licensees covered in Section 471.017, F.S., Renewal of License, please feel free to contact the Board office at (850) 521-0500, ext. 113, or at cedesk@fbpe.org.